Improving the look and feel of your home is affordable with the stylish collection of vinyl flooring in New Hyde Park, NY, from our reputable store. Our flooring showroom is stocked with the most popular flooring styles, including products like vinyl plank flooring. 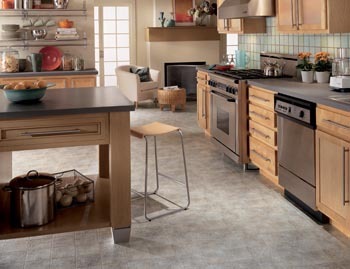 This outstanding floor style is family-friendly, durable, and elegant. Visit our store to take a look at our wide selection of vinyl floors and browse many stunning and affordable vinyl options. Many customers choose vinyl flooring for their home improvement project because it offers the high-end appearance of stone, ceramic, or hardwood but doesn’t have the specialized maintenance needs of natural materials. In addition, vinyl flooring is more affordable than most materials, so you don’t have to go over budget on your home renovations. Best of all, with our Price Protection Guarantee, if you find a better price on the same style and brand of floor within 30 days, we’ll refund you the difference so you always get the lowest price. One of the benefits of vinyl flooring is its ease of installation. However, a proper vinyl flooring installation is best left to our professional flooring installers. The majority of the vinyl materials we sell in the showroom are installed in sheets which can be placed over your existing flooring for easy removal if necessary. Investing in our efficient professional installation ensures your flooring will look great and last long. In addition to ensuring proper installation and long-lasting quality, taking advantage of our vinyl flooring installation services means you’re covered by our ironclad guarantees and warranties. Our Confidence Plus Guarantee covers our 4- and 5-Star Rated floors within 30 days of the install. If you’re not fully satisfied with these select floors for any reason, we’ll happily replace them and even cover the cost of labor. Our Lifetime Installation Guarantee covers all floors installed by us for as long as you have the floor. If you ever experience installation-related issues, we’ll make them right at no cost to you. When you are adding new flooring to a home or office, we want to ensure you feel confident about your flooring decision. We offer free in-home consultations at which we bring the samples to your home or office. If you prefer the look of a natural material like marble or another type of stone, we can bring samples of resilient vinyl plank flooring which is in your price range. In addition to seeing the style in a particular area, a range of samples allows you to see the look of luxury vinyl tile in a variety of rooms. Customers often choose our vinyl flooring styles because they transition beautifully from room to room. Whether you choose to upgrade a single room or you want to outfit your entire home with stylish vinyl floors, our flooring store has everything you need to complete your project. Contact us to schedule vinyl flooring installation. We’re proud to serve clients in New Hyde Park, New York, as well as the surrounding areas.